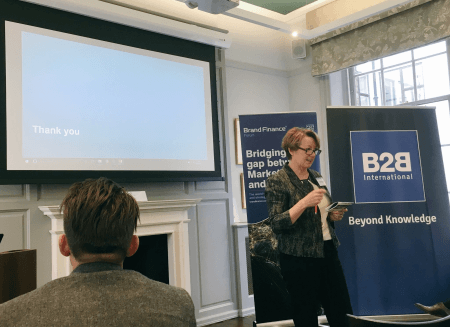 At the start of this month we welcomed a number of b2b brand leaders to an event in Central London to discuss the topic of ‘the value of the b2b brand’. This was a joint event with brand valuation consultancy Brand Finance, who we have worked in partnership with on a number of projects for our clients. In this session Carol-Ann Morgan (Director, B2B International) talked us through some of the theory behind b2b branding, and brand architecture, and how companies use their brands to: better compete, by standing out from the crowd; drive growth, by being the instinctive choice; and increase financial value, through the ability to drive a premium. This was followed by a fantastic case study from Theo Kroese (Global Head of Marketing and Communication) from Mammoet. Mammoet makes its business by moving and lifting the world’s largest objects and buildings, and has the world’s largest cranes to do so. A very ‘b2b’ company, and a very industrial one too. Theo talked about the roll-out of Mammoet’s brand to its internal team over the past few years, and the impact that this has had on the business. In particular Theo spoke about the business’s strapline of ‘The biggest thing we move is time’, and how this now filters through everything the company does, and the impact it has had on the Mammoet team. One statement of Theo’s that held particular resonance, was that his aim was for the brand to be the ‘instinctive choice’ – the one that people would turn to without hesitation. Antoine Philippe (previously head of brand for companies such as Hilti and Henkel) also joined us via a video message. He discussed how he has used a company’s brand in the past as a very effective change-management tool, to align the workforce and get everyone pointing in one direction. Matthew Powell (Research Director, B2B International) shared some of the findings from B2B International’s recent b2b marketing survey. Some of the key facts and figures were that 50% of b2b businesses see branding as a top priority, yet only 37% of b2b companies measure brand health. In addition the study shows that b2b companies, on average, give a score of 6.2 out of 10, when asked how strong a USP their organisation had to differentiate them from other competitor brands – a very low score, which shows there is huge opportunity for businesses that can get their USP and brand promise crystal clear. Nick Hague (Director, B2B International), discussed the different ways in which many b2b organisations measure their brand health. In particular, Nick spoke about the Brand Health Wheel, which is used to gather an holistic view of a company’s brand health, including the strength of its positioning, the awareness and consideration, the internal alignment, and the delivery of the brand promise. Nick also spoke about the importance of company’s understanding what their brand essence is, and making sure everyone has complete clarity on this. The event was concluded by David Haigh (CEO, Brand Finance), Andy Moore (Insights Director, Brand Finance) and Bryn Anderson (Client Services Director, Brand Finance). David spoke about the importance of businesses understanding the financial value of their brand, and the importance of treating the brand as an asset, as well as the different ways in which brands can be valued. Some of the examples outlined included establishing the value of a brand as part of an acquisition, through to understanding the royalty rate a business could charge for its brand to be licenced, and how this all related to the accounting and tax-side of the business. Andy expanded on this by talking about the importance of bringing together the finance and marketing teams in a company to align over the importance of brand value, and explained how Brand Finance have used B2B International’s b2b brand research capabilities to feed into brand valuations. Bryn then talked through a specific case study in the cement industry that Brand Finance and B2B International worked together on, and how international brand health data was used to establish the brand value for one of the world’s leading cement brands. It was a great event, and we thank all the delegates who were able to attend. We will certainly have more events in the future on a few different topics, so keep an eye on our blog for details of what and when these events will be. I found B2B International very helpful and professional. The timeliness of all the work they have done has been excellent. I'm very impressed. We have been very impressed by the quality of work provided. The quality of your verbal presentation was very impressive and brought non-involved managers up to speed immediately. A very positive experience. The innovative methodology was good and the results have been very beneficial. Overall the study was conducted and reported in a professional manner that delivered specific and targeted feedback. The study has helped to provide good insight that wasn't previously there. Copyright © 2019 B2B International. All Rights Reserved.